That taxing the poor makes the poor even poorer is not exactly rocket science. It would be a great boon to the poor man if the income tax and the value-added tax were simply abolished. In Sweden (and I believe in most countries) alcoholic beverages and tobacco products are heavily taxed; those taxes obviously hurt the poor much more than the rich: the poor man may have to quit drinking and smoking just to be able to afford his daily food and paying the rent for his apartment; while the rich man may enjoy his vintage wines and his Habana cigars without it making a dent in his fortune. (In the category of “rich” are also included the politicians who levy the taxes.) The rationalization for this is that it is necessary to preserve the poor man’s health. At least here in Sweden, gasoline and electricity are also heavily taxed; this is part of the effort to “save the planet” from the results of industrialization. The relatively poor – those who can at least afford a car – are made to pay extra for driving to and from their work; but it does not make a dent in the fortune of Al Gore, who is able to afford a well-lit mansion and to drive in a limousine or fly by private airplane while traveling the world to preach austerity to the rest of us. In view of what they hear from the experts, the people cannot be blamed for their ignorance and their helpless confusion. If an average housewife struggles with her incomprehensibly shrinking budget and sees a tycoon in a resplendent limousine, she might well think that just one of his diamond cuff links would solve all her problems. She has no way of knowing that if all the personal luxuries of all the tycoons were expropriated, it would not feed her family – and millions of other, similar families – for one week; and that the entire country would starve on the first morning of the week to follow. […] How would she know it if all the voices she hears are telling her that we must soak the rich? This is what taxing the rich will inevitably accomplish: less investment, fewer jobs, higher prices, scarcer product, and in the end (if practiced consistently enough) starvation. The progressive personal income tax, the corporate income tax, the inheritance tax, and the capital-gains tax are all paid with funds that otherwise would have been saved and invested. All of them reduce the demand for labor by business firms in comparison with what it would otherwise have been, and thus either the wage rates or the volume of employment that business firms can offer. For they deprive business firms of the funds with which to pay wages. By the same token, they deprive business firms of the funds with which to buy capital goods. This, together with the greater spending for consumers’ goods emanating from the government, as it spends the tax proceeds, causes the production of capital goods to drop relative to the production of consumers’ goods. This implies a reduction in the degree of capital intensiveness in the economic system and thus its ability to implement technological advances. The individual and corporate income taxes, and the capital-gains tax, of course, also powerfully reduce the incentive to introduce new products and improve methods of production. In all these ways, these taxes undermine capital accumulation and the rise in the productivity of labor and real wages, and thus the standard of living of everyone, not just of those on whom the taxes are levied. Starting with tax cuts for the so-called rich — based on equivalent reductions in government spending — is the only hope for the resumption of significant economic progress, indeed, for the avoidance of economic retrogression and growing impoverishment. Because of this, it is actually the quickest and surest road to any major reduction in the tax burden of the average wage earner. It holds out the prospect of the average wage earner being able to double his standard of living in a generation or less. The average standard of living would double in a single generation if economic progress at a rate of just 3 percent a year could be achieved. Such economic progress would also mean a halving of the average wage earner’s tax burden in the same period of time — if government spending per capita in real terms were held fixed, for then he would have double the real income out of which to pay his present level of taxes. And then, of course, once all the taxes that most stood in the way of capital accumulation and economic progress were eliminated, further reductions in government spending and taxation could and should take place that would be of corresponding direct benefit to wage earners, that is, show up in the reduction of the taxes paid by them. But if there should be no taxes on the poor and no taxes on the rich, what taxes should there be? Who, then, should pay the salaries of our politicians and their henchmen other public servants? Or should there be no politicians and no government at all? Should the proper functions of government (as some anarcho-capitalists suggest) be taken over by insurance companies? At least, they would not levy taxes but be paid voluntarily. In a fully free society, taxation – or, to be exact, payment for governmental services – would be voluntary. Since the proper services of a government – the police, the armed forces, the law courts – are demonstrably needed by individual citizens and affect their interests directly, the citizens would (and should) be willing to pay for such services, as they pay for insurance. As an illustration (and only as an illustration), consider the following possibility. One of the most vitally needed services, which only a government can render, is the protection of contractual agreements among citizens. Suppose that the government were to protect – i.e., to recognize as legally valid and enforceable – only those contracts which had been insured by the payment, to the government, of a premium in the amount of a legally fixed percentage of the contractual transaction. Such an insurance would not be compulsory; there would be no legal penalty imposed on those who did not choose to take it – they would be free to make verbal agreements or to sign uninsured contracts, if they so wished. The only consequence would be that such agreements or contracts would not be legally enforceable; if they were broken, the injured party would not be able to seek redress in a court of law. When one considers the magnitude of the wealth involved in credit transactions, one can see that the percentage required to pay for such governmental insurance would be infinitesimal – much smaller than that paid for other types of insurance – yet it would be sufficient to finance all the other functions of a proper government. Men would pay voluntarily for insurance protecting their contracts. But they would not pay voluntarily for insurance against the danger of aggression by Cambodia. […] A program of voluntary government financing would be amply sufficient to pay for the legitimate functions of a proper government. It would not be sufficient to provide unearned support for the entire globe. It may be observed, in the example given above, that the cost of such voluntary government financing would be automatically proportionate to the scale of an individual’s economic activity; those on the lowest economic levels (who seldom, if ever, engage in credit transactions) would be virtually exempt – though they would still enjoy the benefits of legal protection […] These benefits may be regarded as a bonus to the men of lesser economic ability, made possible by the men of greater economic ability – without any sacrifice of the latter to the former. So under this proposal, the taxes would, predominantly, maybe even exclusively, be paid by the rich. But it certainly wouldn’t have the effects that taxes on the rich have today. …the principle will be practicable only in a fully free society, a society whose government has been constitutionally reduced to its proper, basic functions. […] Any program of voluntary government financing is the last, not the first, step on the road to a free society – the last, not the first reform to advocate. If we were to argue for such a reform today, would the politicians even listen? One obvious stumbling block is that a fully free society would mean fewer politicians and government employees than we have today – fewer by a large extent. Would today’s politicians and government officials voluntarily step down, take their place in the market economy and leave the rest of us alone and only interfere in our lives when our rights have been violated? A political career is quite lucrative today. Politicians grant themselves quite handsome salaries – and when they are voted out of office (which does happen, sometimes), they also grant themselves quite handsome pensions; they do not even have to begin looking for other jobs, if they don’t feel like it. And if they do feel like it, they take well-paid jobs as lobbyists, without having to relinquish their handsome pensions. (At least, this is the case here in Sweden, but I do not think it is much different in the rest of the Western world.) With a government “constitutionally reduced to its proper, basic functions”, this would not be possible. So, judging by the situation today, I have to be pessimistic. And the distant future is – well, distant.
) This part of the essay is adapted from Capitalism: A Treatise on Economics, p. 308-310.
) Ayn Rand’s essay does not seem to be available on the web, so you will have to buy the book. – There is a good elaboration on her essay by Craig Biddle of The Objective Standard; if you are not a subscriber, you can download it for the modest price of $3.95.
) Another stumbling block is (to use George Reisman’s words) “massive ignorance of economics”. It will take, at best, a generation to uproot “mainstream” economics and replace it with sound, “Austrian” ideas. This is an old Soviet poster depicting the difference between communism and capitalism. To the left, the exploited worker under capitalism; to the right, the same worker under communism. See anything wrong here? This Soviet poster describes lives under capitalism and socialist USSR. Under capitalism: the overworked worker is barely able to survive on his meager wage, while the fat capitalist sits on sacks of gold–wealth serving his greed and war lust. 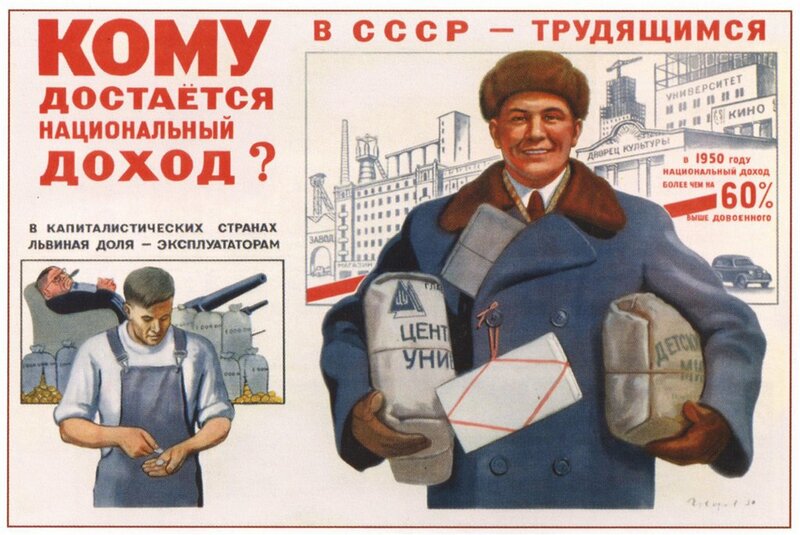 Under socialism: a well-fed and well-dressed worker is happily carrying loads of merchandise; in the background are university, cinema, factories–wealth serving the masses. Of course, by now everybody knows that nothing could be further from the truth. It is, to be precise, exactly the opposite! Still, it seems that little has changed in the public’s fundamental understanding of how capitalism operates and whom it benefits. Under capitalism capitalist wealth is at the service of the buying public, i.e. the workers. Workers far from being exploited by that capital are directly benefited by the wealth of the richest capitalists precisely because they do not keep that wealth in the form of cash (or gold) but invest it in capital goods and use it to pay wages. My own comment is that this would be funny, if it weren’t tragic. There are still people who believe the worker is exploited under capitalism and that communism will pour a horn of plenty on him. That this is praxeologically wrong may be hard to see for those unacquainted with sound economics; but is it really hard to see that it is empirically wrong?